This weekend I read a remarkable book that I’ve been meaning to read for awhile now. And, though the book itself might not be astonishingly remarkable, the subject matter is something with which I feel all members of the Church of Jesus Christ of Latter-day Saints ought to be familiar. 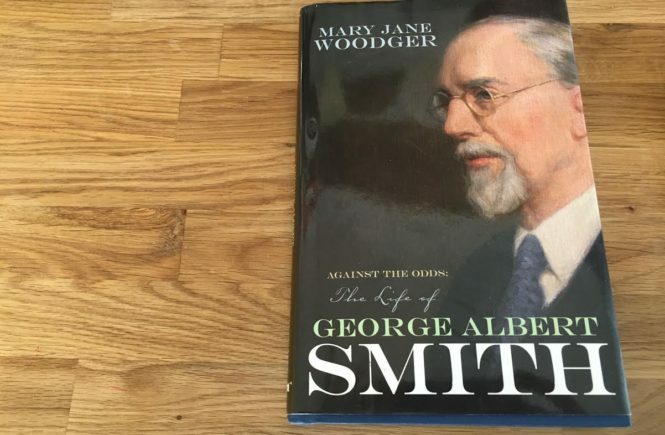 The book, entitled, “Against the Odds: The Life of George Albert Smith,” not surprisingly chronicles in detail the life of George Albert Smith. He was the eighth president of the Church of Jesus Christ of Latter-day Saints, serving during the conclusion and aftermath of World War II. But his actual presidency is not what made the book so important to me. It was his early life, and most especially his first few years as an Apostle (he became an Apostle in his early thirties, I believe), that was crucial. Reading about his youth as an incredibly wild and rambunctious child who played the banjo and got into all kinds of shenanigans gave me hope for my own children. When he put his mind to it, he worked hard, but he was also a typical child. I am grateful for reminders like this, of our church leaders’ humanity. But most importantly, George Albert Smith suffered from mental health issues and chronic illness. I feel that so often, the Church glosses over these realities in its leadership, saying that they had medical conditions or health problems, but ignoring what those conditions and problems really were and how they affected the individual suffering with and through them. Reading the symptoms of George’s issues made me feel so much for him. I can totally understand his anxiety, his over-responsibility, his feeling that he had to do everything he possibly could, and his depression. He worried about cleanliness. He worked himself into exhaustion. I only wished, as I read, that he had lived in an era of cognitive behavioral therapy and a time when these “nervous” conditions were understood and treatable. Rather than being told he had to live in a tent in the backyard (literally) to recuperate, he could have been given practical and meaningful care. I cringed at all the well meaning messages he received from church members that they were praying for him and his recovery. Of course, it is wonderful to have people pray for you, but mental health concerns need even more than prayer and a stubborn resolve to shrug them off and move on with life. Even George’s wife shared her share of anxiety and depression, or so it appears from the letters she sent George when he was away on missionary work and church assignments. I saw myself in her desperate pleas for him to come back to her. I vividly recalled times when I struggled with my OCD and texted my husband in mental anguish, just needing to know someone else was there. I felt like, if only I was not alone, I could hold on from day to day. Between George and his wife, my heart ached as I read the book. I appreciated their struggles and empathized with their mental battles. I felt that all church members should know that it is okay to go through these struggles and battles. All church members need to realize that even an Apostle and eventual great Prophet of God struggled with severe mental health issues and chronic health problems (relating to both his eyes and his stomach/digestive system). He battled them. He had to take significant amounts of time off to deal with them. He missed sessions of General Conference. He couldn’t speak publicly for long periods of time. And you know what? The Lord didn’t throw him off. This servant of the Lord did what he could, and the Lord protected and preserved his life, saving him—and the kindness and empathy he gained over the course of his trials—for a period of time that so needed kindness and empathy. The Lord called George as Prophet at a time during which the world needed healing and forgiveness, and George was able to provide both and lead the Church in doing so. It’s essential that we members of the Church understand our history, and not just the touted and general history we read in our Church manuals. When we understand the men and women who have led and formed the Church—and not just their strengths but also their weaknesses and their trials—we will be better able to understand what kind of a church we belong to and of which we are a part. We aren’t perfect. And I’m so glad for that. No church members have been perfect, and it’s so much better that way. It is such a relief. It’s the imperfections and the struggles that allow us to understand and empathize with each other. It’s what makes us a moving, breathing, real force. We aren’t static, and we can’t be, not if we want to help change and heal others and ourselves. Do you think we need to be more honest with our imperfections in the Church? Thanks for sharing this! I read an article on President Smith that related some of his mental health struggles (the cleanliness ones reminded me a lot of my own OCD) and didn’t realize there was a book as well. Its so comforting to see that despite his mental illnesses, he was able to do the great service God wanted him to do. It gives me hope that I, too, will be enabled to do what God would have me do, despite my own mental illnesses.